Checking-in to places and posting your travels on social media is the trend these days. But international data roaming charges can be exorbitant, not if you’re visiting Hong Kong or Singapore. 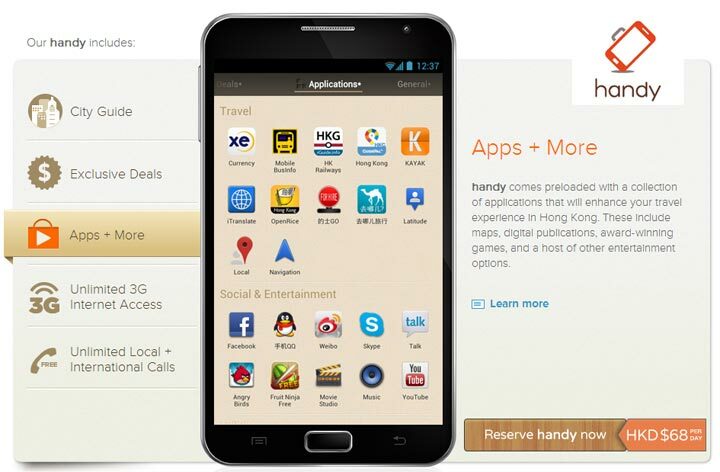 Handy is a smartphone rental service in Hong Kong, and has just launched operations in Singapore. The company offers Samsung Galaxy Note phones for rent to travelers at $9 (HKD 68) a day in Hong Kong and $12 (S$15) a day in Singapore. The price includes unlimited 3G data and international calls. Yes, you read that right! Another awesome thing about handy is that it allows tethering for the same price – you could tether a laptop in a pinch and get some surfing done outside of a Wi-Fi zone. Look out for their service counters at tourist hot spots, such as at the Hong Kong International Airport, as well as the Convention and Exhibition Centre in Wan Chai and a visitor center run by the country’s tourism board located in the Tsim Sha Tsui district. The developers have put a custom user interface on the phones that opens at a landing page with deals and recommendations for sightseeing and restaurants. With a lot of tours and ticketed information like ferry rides that you can book through the apps, this is a fantastic and cheap alternative to those jaw-dropping prices on data and international roaming. When a user rents out a device, the company puts an authorization hold on their credit cards, so in the event of a device getting broken or lost, the amount to fix or replace it is charged to the card. Other companies that offer similar services in Singapore are TouristPads and SGPad, that rent our iPads to travelers. SGPad’s rate is $39.90 a day, and TouristPads’ is $24 a day with a free delivery to the airport or your hotel.